Info "Count the segments of orange! Whoo!" Piece Meal is one of Ashley's microgames in WarioWare: D.I.Y. The point of the game is to count the number of slices the orange has. 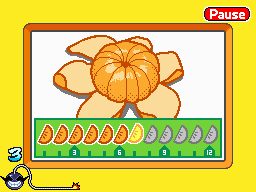 To do so, the player must tap the slices of the orange. On the bottom is a meter that ranges from the number 1-12. Every time a slice is tapped, a slice on the meter lights up. If the player counts the correct number of oranges when time is up, the game is won. However, if the player doesn't match the number of slices when time runs out, the game ends in a loss. If the player goes over the amount of slices, the game is automatically lost, even if the time is still running. This page was last edited on July 18, 2018, at 22:37.